Here’s some health news about lycopene that goes beyond its usual anticancer role. Researchers have discovered that this healing food may also be a strong candidate for treating inflammatory conditions. Lycopene is an antioxidant found in tomatoes that has proved its worth by helping to lower the risk for prostate cancer. Scientists at the Research Institute of Pharmaceutical Sciences in Korea conducted a study to look at the anti-inflammatory effects of lycopene. In particular, they focused their research on a protein with a very odd name: high mobility group box 1, or HMGB1. Activated macrophages—cells that surround and then digest cellular debris and pathogens—secrete HMGB1, which in turn can trigger an inflammatory response. Any antibodies that can neutralize HMGB1 will offer protection against the sort of damage and tissue injury found in conditions like arthritis, colitis and ischemia. The Korean researchers found that lycopene inhibits HMGB1 and consequently the activation of proinflammatory cells. For this reason, the researchers concluded lycopene could be useful as a natural therapy for inflammatory diseases. 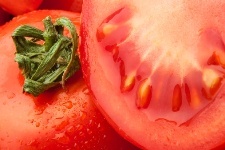 To add lycopene to your diet, your best bet is to add some tomato products. Fresh tomatoes contain lycopene. too, of course, but processed tomatoes may contain as much as three times the amount. That means delicious foods like tomato sauce could help ease inflammation and pain in your joints and elsewhere. One thing to note: lycopene is fat-soluble. There’s a reason why olive oil is often used in tomato sauces—partly because it tastes good and partly because the oil will help you absorb more lycopene than you would if you ingested the antioxidant without any oil. Bring on the spaghetti! For an overall healthy meal, make some whole grain pasta and use a little bit of low-fat cheese and freshly ground pepper. Besides tomatoes, you can add “red fruits” to your diet. That means pink or red guava, pink grapefruit, papaya, and watermelon. These fruits will also give you a healthy dose of vitamin C that can boost your immune system.